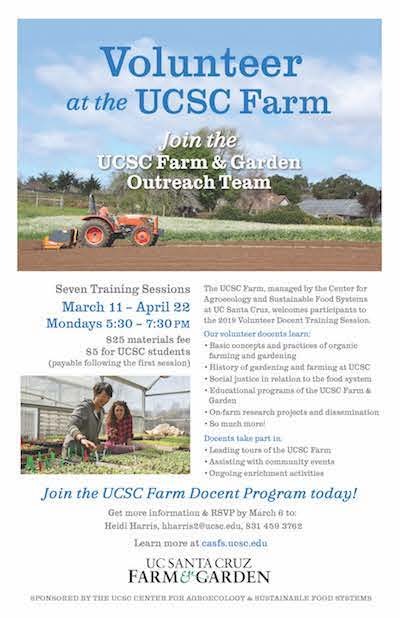 A 7-session training for UCSC Farm tour guides and community outreach volunteers starts March 11. The 2019 Farm & Garden docent-training program will take place at the historic Cowell Ranch Hay Barn (adjacent to the UCSC Farm) on seven Monday afternoons from 5:30 pm to 7:30 pm, beginning March 11 and ending April 22. During the training sessions, participants will learn about organic farming and gardening practices, the history of the Alan Chadwick Garden and the UCSC Farm, and the research and education work of UCSC’s Center for Agroecology & Sustainable Food Systems (CASFS), which manages the Farm & Garden programs and facilities. There is no pre-requisite to become a docent—just a willingness to learn and share. After completing the training, docents are asked to lead a minimum of six tours a year and are encouraged to help with public education events, plants sales, and other efforts that support the Farm & Garden’s community outreach work. Docents will also enjoy ongoing, free enrichment workshops on a variety of topics. Cost of the docent training is $25 to cover materials, or $5 for UCSC students. The initial session on March 11 is free and fees only apply if you continue with the training. Free parking is available at the Hay Barn. Active docents receive a yearly membership to the Friends of the UCSC Farm & Garden, which includes discounts at plant sales and local nurseries. Docents also receive free admission to many of the Friends’ gardening and fruit tree care workshops. For more details, please contact Heidi Harris at 831.459.3762, or hharris2@ucsc.edu by Wednesday, March 6 . The training is sponsored by the Center for Agroecology & Sustainable Food Systems at UC Santa Cruz. You can learn more about the UCSC Farm & Garden and CASFS at the CASFS website.